Letty Tumangan and Rotary International Director Guiller Tumangan, Rotary Club of Rotorua Sunrise Past President and Rotary Oral Language Programme Coordinator Sue Gunn, WHPS Assistant Principal Megan Marshall, and Rotary District 9930 Governor Mike Smith at WHPS. 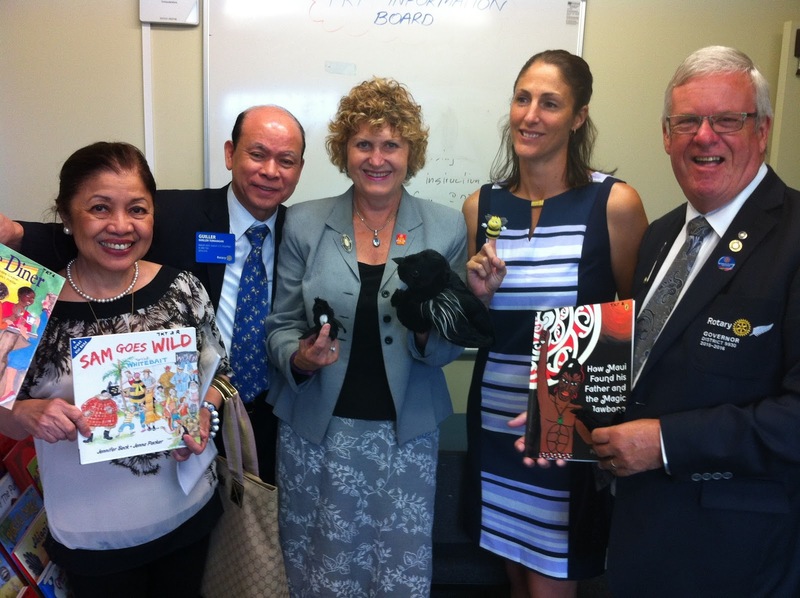 Rotary International Director Guiller Tumangan and his wife Letty, visiting from the Philippines on February 17, picked up the book Sam Goes Wild to be read to them while viewing the Rotary Oral Language Programme run at Western Heights Primary School (WHPS) in Rotorua, NZ. Guiller and Letty were very impressed with the programme where volunteer tutors work one-on-one with Year 1 students to improve their oral language and set them up for formal learning in school. The school’s vision is E Tu Hei Maunga (stand tall as a mountain).